☛ Drink as much as the water you can drink, don’t go for any health drink or fruit juice. They contain calories, which of no use. And if you don’t want to drink plain water, then you can add lemon or mint leaves. ☛ Ban white, you have to reduce the white substance from your diet like rice, spaghetti, pasta, bread, etc. you can replace it with whole grain bread and other food products. ☛ Cardio burns your fat, so do cardio 30 minutes in your whole day. ☛ Make Coffee you work out buddy, drink coffee one hour before you start any workout. You will lose more fat without any realization. ☛ $ex, Best workout with fun. Do you –on-top $ex on a daily basis and lose the weight. ☛ Do push-ups, sit-ups, squats and lunges on alternative days. If you feel like you can also do them daily. ☛ 30 minutes saves you a lot, sleep extra 30 minutes after you wake up in the morning. ☛ Stop eating junkies, like chips, chocolate cake and burgers. Replace it salmon in lunch. ☛ Make sure to pose correct before clicking the pictures. 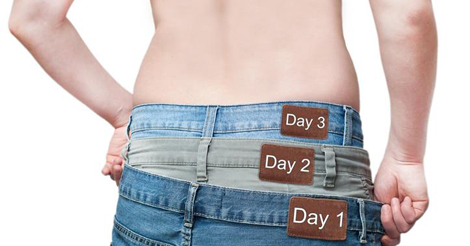 ☛ You can also use inners which will hold your fat in.